Make this Instant Pot Chicken Adobo Recipe (Pressure Cooker Chicken Adobo) with Pot-in-Pot Rice. Quick & Easy classic Filipino favorite comfort meal. No need to marinate ahead. Caramelized complex balance of bold flavors. Soo delicious! If you’ve never tried Philippine Adobo, you’re seriously missing out! Adobo is sometimes referred to as the unofficial Philippines national dish. 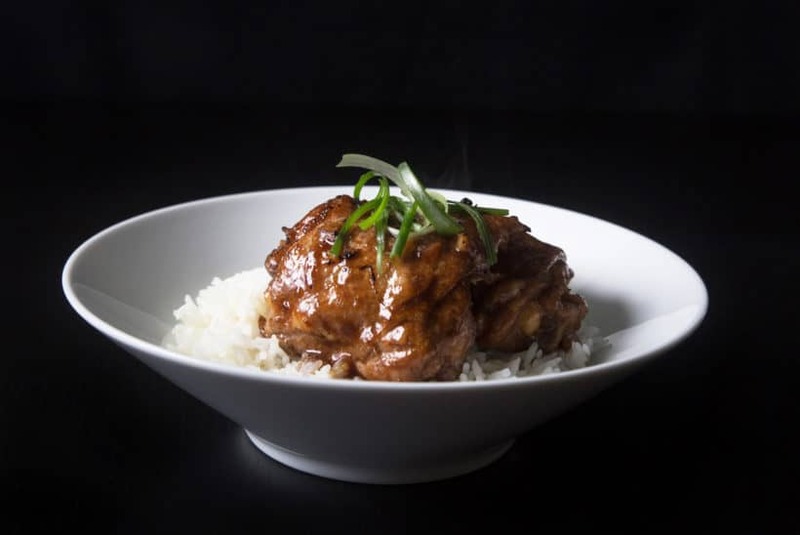 The super bold complex flavors: sharp tart, deep savory, slight sweet & spiced adobo sauce soaked in the juicy tender chicken make it super appetizing to eat. If you want to kick it up a notch, finish the chicken under a broiler to enjoy the deeply caramelized adobo deliciousness. As we were developing this recipe, we taste tested different brands & combinations of vinegar & soy sauces. Since the Filipino Soy Sauce tastes more sour than the Chinese Light Soy Sauce (not low sodium soy sauce), we achieved a satisfactory equilibrium by mixing the two soy sauces together. 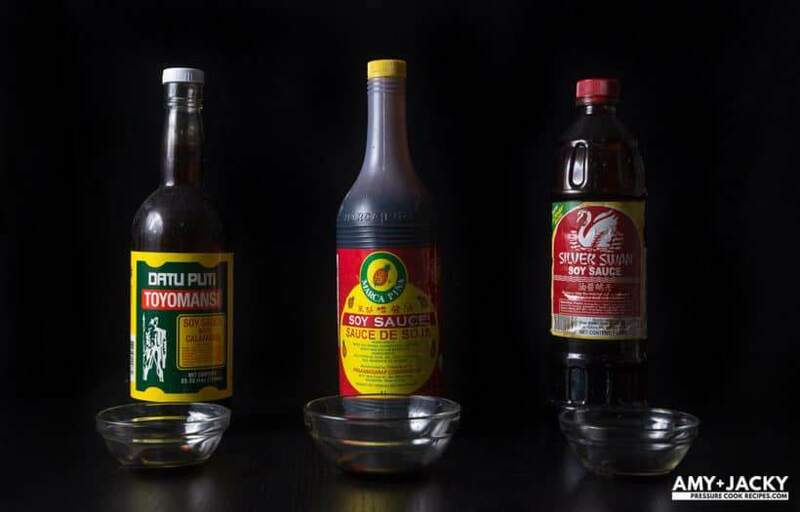 *Note: Different brands of Filipino Soy Sauces and Vinegar can taste vastly different due to various factors such as different levels of acidity and ingredients. Even different bottles of the same brand can taste different. For reference: we used Silver Swan Filipino Soy Sauce + Lee Kum Kee Light Soy Sauce + Red Boat Fish Sauce + Lorins Sukang Sasa Filipino Vinegar for this recipe. 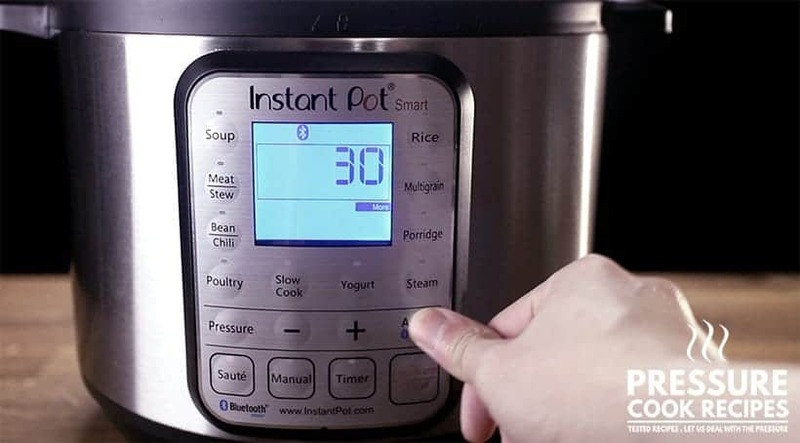 Try to get your hands on a Stainless Steel Bowl for using the Pot-in-Pot method in Instant Pot Pressure Cooker. For those who just want to make Instant Pot Chicken Adobo, you can simply skip the pot-in-pot rice and use the same pressure cooking time. Heat up your pressure cooker (Instant Pot: press Sauté button, then Adjust button to Sauté More function). In a medium glass measuring cup, mix and combine 1 tbsp (12.5g) sugar, 1 tbsp (15ml) fish sauce, ¼ cup (63ml) Filipino soy sauce, ⅓ cup (83ml) light soy sauce, and ⅓ cup (83ml) Filipino vinegar. Add 1 tbsp (15ml) oil in Instant Pot. Sauté onions for 2 minutes. Add 12 crushed garlic cloves, 1 tsp (4g) whole black peppercorn, dried red chili, and 4 dried bay leaves and sauté for another 45 seconds. Add adobo sauce mixture in Instant Pot and deglaze by scrubbing the flavorful brown bits off bottom of the pot with a wooden spoon. Coat the chicken with adobo sauce by dipping the skin side into the adobo sauce, then flip to place them skin side up in Instant Pot. 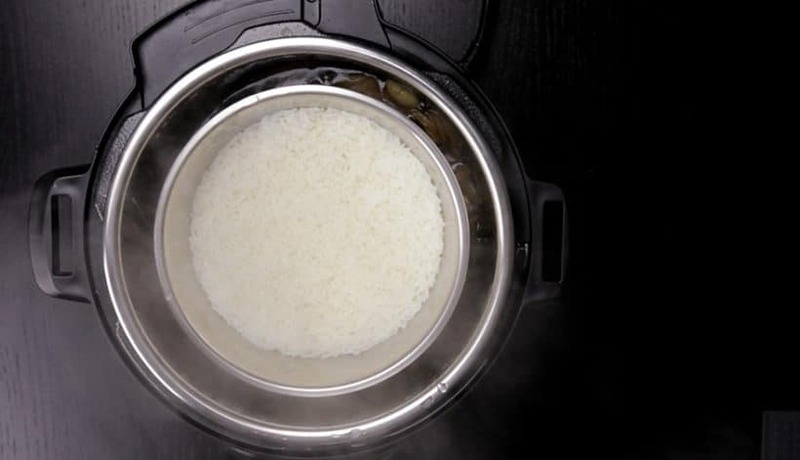 Place a steamer rack in Instant Pot and layer a stainless steel bowl with 1 cup (235g) Jasmine rice + 1 cup (250ml) cold water on top (as shown in photo below). 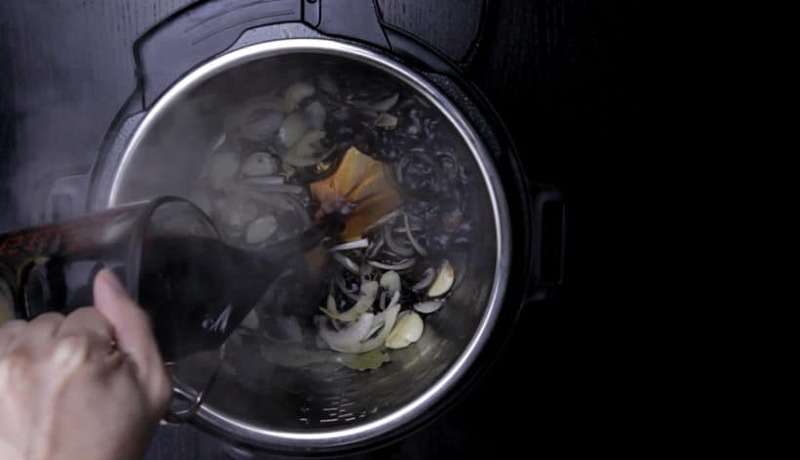 Pressure Cooking Method: High Pressure for 6 minutes, then 10 minutes Natural Release (after pressure cooker has finished cooking, wait 10 minutes then carefully release the remaining pressure). Turn off heat. Open lid carefully. Remove stainless steel bowl & steamer rack. Taste and adjust the seasoning with more vinegar, sugar, or soy sauce accordingly. Coat chicken thighs with adobo sauce by placing them back in the pot. Place chicken adobo (coated with a thin layer of sauce on top) on a baking tray and put it under a broiler for 5 – 10 minutes. This will maximize the flavor and crisp up the skin. Serve chicken adobo with Jasmine rice. Drizzle lightly with adobo sauce and garnish with green onions on top. Make Instant Pot Chicken Adobo Recipe (Pressure Cooker Chicken Adobo) with Pot-in-Pot Rice. Quick & Easy classic Filipino favorite comfort food. No need to marinate ahead. Caramelized complex balance of sharp, tart, bold flavors with a hint of spiced sweetness. SO good! Prepare Pressure Cooker: Heat up your pressure cooker (Instant Pot: press Sauté button, then Adjust button to Sauté More function). Make sure your pot is as hot as it can be (Instant Pot: wait until indicator says HOT). 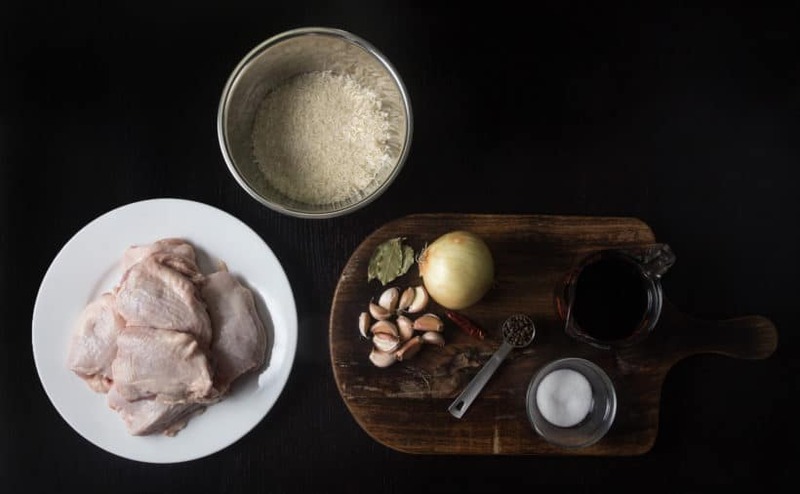 Make Adobo Sauce: In a medium glass measuring cup, mix and combine 1 tbsp (12.5g) sugar, 1 tbsp (15ml) fish sauce, ¼ cup (63ml) Filipino soy sauce, ⅓ cup (83ml) light soy sauce, and ⅓ cup (83ml) Filipino vinegar. Sauté Onions and Spices: Add 1 tbsp (15ml) oil in Instant Pot. Sauté onions for 2 minutes. Add 12 crushed garlic cloves, 1 tsp (4g) whole black peppercorn, dried red chili, and 4 dried bay leaves and sauté for another 45 seconds. Deglaze: Add adobo sauce mixture in Instant Pot and deglaze by scrubbing the flavorful brown bits off bottom of the pot with a wooden spoon. 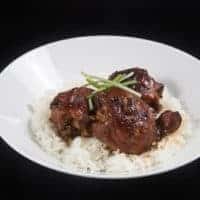 Pressure Cook Chicken Adobo and Pot in Pot Rice: Coat the chicken with adobo sauce by dipping the skin side into the adobo sauce, then flip to place them skin side up in Instant Pot. Place a steamer rack in Instant Pot and layer a stainless steel bowl with 1 cup (235g) Jasmine rice + 1 cup (250ml) cold water on top. Close lid and pressure cook at High Pressure for 6 minutes + 10 minutes Natural Release (after pressure cooker has finished cooking, wait 10 minutes then carefully release the remaining pressure). Turn off heat. Open lid carefully. 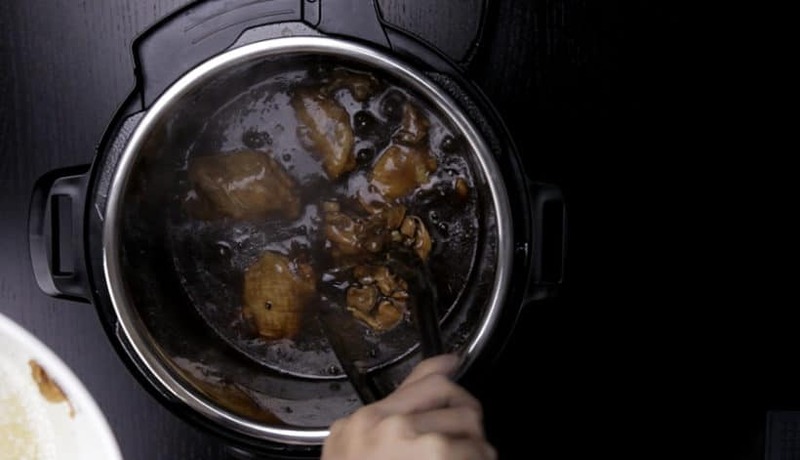 Thicken Chicken Adobo Sauce: Remove stainless steel bowl & steamer rack. Set aside the chicken thighs in a serving bowl. Press Cancel button, then Sauté button to heat up the sauce. In a small mixing bowl, mix 2.5 tbsp (22.5g) cornstarch with 3 tbsp (45ml) cold water. Mix it in one third at a time until desired thickness. Taste and adjust the seasoning with more vinegar, sugar, or soy sauce accordingly. Coat chicken thighs with adobo sauce by placing them back in the pot. 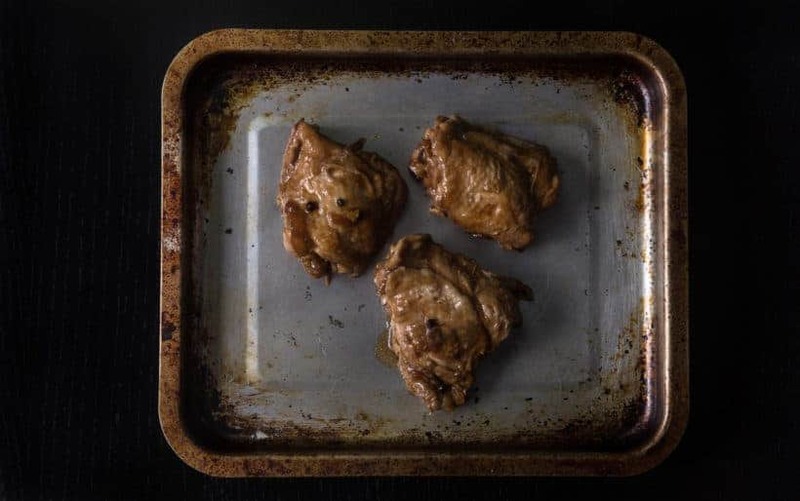 Optional Step to Crisp Skin: Place chicken adobo (coated with a thin layer of sauce on top) on a baking tray and put it under a broiler for 5 - 10 minutes to maximize the flavor and crisp up the skin. 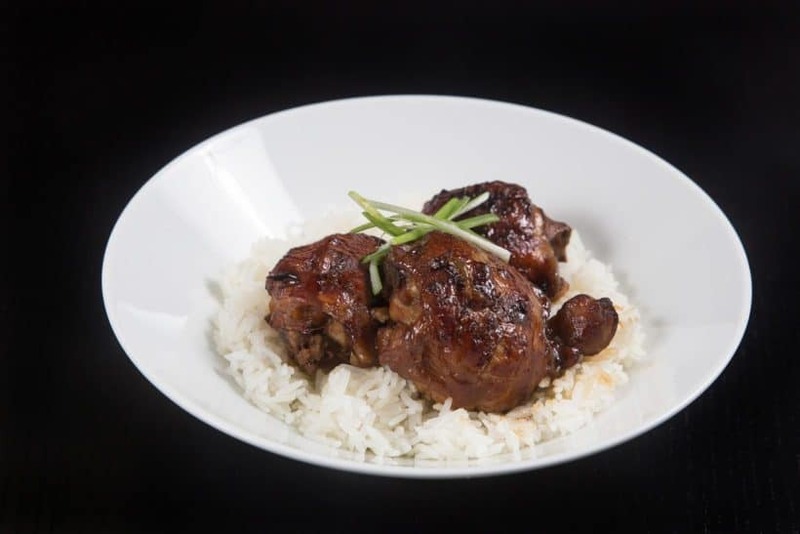 Serve: Serve chicken adobo with Jasmine rice. Drizzle lightly with the adobo sauce and garnish with green onions on top. Thanks for giving us great recipes! I’ve recently discovered your website, and you do an amazing job. I know taste is personal, but I found the sauce a little salty (even though I went out and bought the Filipino soy sauce) and used all of the specific ingredients you noted. I will try with a little less soy sauce next time. I also added an additional dried red chili. The one question I had was, I don’t like the bits of peppercorns left in the sauce at the end. I want the flavouring of it, but I don’t like crunching down on a peppercorn bit in the finished product. Any suggestions on how to cook with it, but somehow fish it out of the sauce at the end without having to tediously remove them one at a time. I know the idea is probably for the peppercorn to cook down, but I still don’t like a mouthful of peppercorn. If you have one of those tea stainless steel ball, you can add the peppercorn in there. I’m excited to try out this recipe! Are there any sides recommended for this dish? Preferably vegetables? Thank you. You can cook some cabbages in the sauce. This is my first rating on this site! I’ve used this recipe many times, I’ve even served it to my Filipino mom who was very interested in the recipe. Great job! Is the chicken in the recipe, bone in or boneless? If using bone in, how long to cook? Thinking of making this for a friend who just had a baby. Looks delicious! Great flavor, easy and efficient using pot in lot method for the rice. I used brown rice and added 1/3 cup more water. After cooking I let it naturally release and stay on low 2 hours. It tasted great! Hello! I tag all my IP friends on your wonderful video recipes!! You are both great teachers, THANK YOU! My quick question is the Fish Sauce an absolute must in recipes? I have wanted to make a few of your recipes, but many contain this ingredient. I have tried one recipe using the fish sauce, and unfortunately I couldn’t tolerate the taste. Is there something I can sub in or can I leave it out and get close to the taste? Keep up the great work! Thank you for your support & question. The fish sauce is not a must. You can substitute it with the same amount of regular soy sauce. I recommend trying Red boat fish sauce as it tastes the best (in my opinion). I am new to the IP world. I have heard that you can add frozen meat to the pot. How does frozen thighs affect this recipe? For this recipe, you will want to add 1 minute to the cooking time. This was the first recipe I made in my instant pot. It was delicious and easy to follow. The chicken was very tender. I loved the pot in pot rice. Will definitely be made again. This was SO good! I used a Filipino soy sauce, a light soy sauce, and rice vinegar (since I didn’t have any Filipino vinegar on hand). The broiling of the chicken is so key! It made the skin deliciously crunchy, even under the gravy. I also added a little brown sugar to the sauce at the end. My husband requested this be made once a week. Thanks and can’t wait to try more recipes! So happy to hear your husband enjoyed it as well! On your nutritional information, does this include chicken, adobo sauce & rice? or just the adobo sauce & chicken? Also, is this based on a 4-serving batch? Yes, it is based on 4 serving. It includes the chicken, adobe sauce, and I am quite sure it includes the rice as well. I made your Tuscan chicken recipe last night and it was delicious. I see most of your chicken recipes use thighs. I understand why, but my husband prefers boneless breasts. Can I convert this recipe using the thicker boneless breasts? How long would I cook the chicken for, and still get moist chicken? You can convert the recipe to boneless breast. It will take 5 minutes at high pressure + 8 minutes release. The idea is not to overcook, but, without the fat, white meat will be less moist than dark meat. I want to adapt the recipe I received from a Filipina friend. I have used it for 40 yrs and the family loves it. I use 2 # equal parts cubed pork and cubed chicken breasts. What would be my cooking time? Thank you so much. I am very excited about using the i.p. to make the Adobo. What kind of cut is the pork? Cubed chicken breasts will take 1 – 2 minutes at high pressure with 10 minutes natural release. Is the pressure cooking time the same if I want to omit cooking the rice? I didn’t cook rice in the Instant Pot because I didn’t have a bowl small enough to fit. I cooked the chicken for 5 minutes, and think it was a tad too long. I will try at 4 minutes next time (if cooking without the rice). I’d like to try this, but the sodium content is much too high! Can low sodium soy sauces be used instead? The soy sauce is one of the main ingredients in this recipe, so changing it to Low sodium soy sauce will alter the flavor profile quite a bit. It should still be good. Give it a try to see if you like it. I have white vinegar. I have apple cider vinegar. I have rice wine vinegar. I have balsamic vinegar. Will any of these do? White vinegar will work fine, but the flavor profile will be different. Should I cook them without cutting into cubes to hopefully retain more moisture? Thanks! Definitely cook them without cutting into cubes. It will be roughly 4 minutes + 10 minutes release. Can a glass pyrex bowl/container be used instead of a stainless steel one for the rice? Glass pyrex bowl will work, but you may need an extra minute. Could you add to my post that I cooked the brown jasmine rice separately? There’s no way it would have worked together with the chicken since it usually takes around an hour. I don’t want anyone else to try the pot-in-pot with brown rice. Another hit! I was intrigued when I read the posts by Filipinos. I’m married to a Filipino (who doesn’t cook) and with tips from his sister I’ve learned to make a pretty good chicken adobo–at least he’s always happy and it disappears quickly. He actually said that this was the best chicken adobo I’ve ever made! It smelled so good and tasted even better; can’t wait to make it again. Thank you again for such wonderful recipes! Thank you for the recipe! I will try it tomorrow. I plan to use about 2 lbs of chicken drumsticks since I have those already. Do I need to change the time if they are frozen? I would recommend increasing the cooking time by 3 minutes. We followed this recipe exactly as written. We purchased the ingredients from Amazon through your website. We were disappointed in the results in that the sauce was so “salty” it lost all the other flavors. We know it has a high sodium content with these soy sauces but too overwhelming. Ideas to bring out more flavor? I am sorry to hear what happened. The dish is supposed to be salty, but not overly salty. Do you remember which type & brand of vinegar was used. The vinegar and sugar is used to balance the whole dish. Hey guys, im going to double the recipe ,cook the rice separately and add pork belly too. 16 mins quick release for pork, then adding the thighs and 6 mins , 10 min natural release is ok? Thanks. How can I double or triple this recipe? Thank you! Since the get up to pressure time will be longer, I would reduce the cooking time by 1 minute if you are doubling the recipe. I’m anxious to try your recipe, thanks for sharing! What’s the name of the Filipino vinegar you used? We used two different brands and they both work great. Would this time and method work with brown jasmine rice? brown jasmine rice will take 15 – 18 minutes and 10 minutes Natural release so it is better to cook them seperately. Delicious and very simple to prepare. The tangy sauce from the Filipino vinegar was surprisingly good. Thank you so much for your kind words on the recipe. Your continuous love and support mean so much to us!